The global analog integrated circuit market will grow 8 per cent in 2018 due to rising demand from automotive, cell phones and Internet of Things and other applications. The market will increase from $53.1 billion in 2017 to $57.1 billion in 2018 as unit shipments rise 6.2 percent, according to Semico Research. 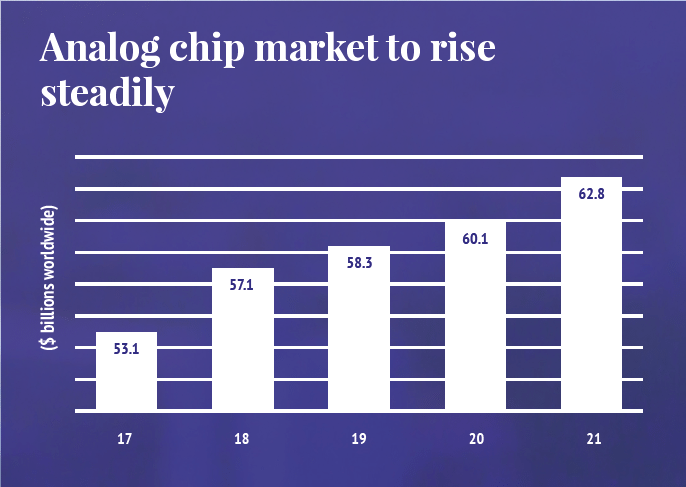 Analog demand will continue to grow through 2021 when analog chip revenue reaches $62.8 billion for a compound annual growth rate of 4.3 per cent. 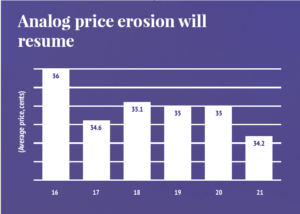 The good news for semiconductor buyers is despite growing demand for analog chips, the overall average selling price won’t increase through 2021, although there could be selective price increases for some analog ICs. “Fabs want to build products that generate the most return,” said Brian Anderson, senior analyst, power management, technology, media, for market researcher IHS Markit. “Their ability to do that is bound by contractual agreements.” Because demand for analog is strong, chipmakers are going to want to “maximise return so I expect there will be tougher negotiations this year than in the past” which could mean higher prices for some analog chips. At the very least, it will mean prices won’t decline as they have in previous years. 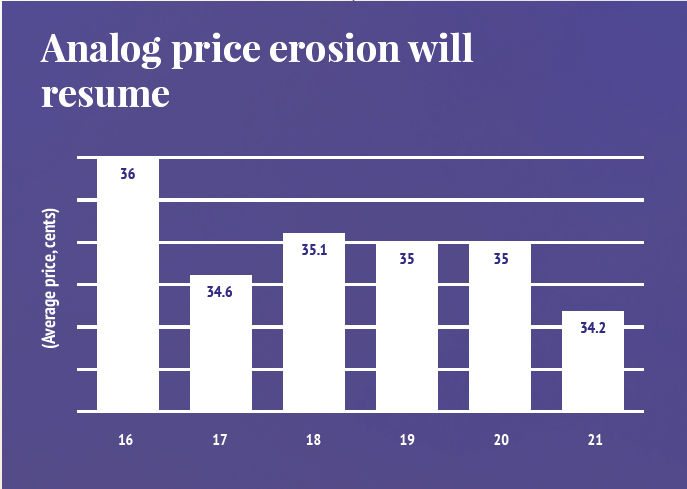 Last year the average price for an analog IC was 34.6 cents and will rise to 35.1 cents in 2018 and remain steady until 2021 when the price will drop to 34.2 cents, according to Semico. However, in 2012 the average price was 43 cents and it then dropped to 38 cents in 2013 and fell each year steadily through 2017 when it was 34.6 cents. One reason for the price decline is that in recent years more analog IC production has moved to 300mm production which has increased supply and reduced cost for some analog semiconductors. Analog chip manufacturers such as Texas Instruments, Infineon, STMicroelectronics and foundries including TSMC, UMC, Globalfoundries, TowerJazz and Powerchip have 300mm capabilities for analog, according to Semico. “In 2018, 45 per cent of the silicon processed for analog will be on 300mm wafers,” said Jim Feldhan, Semico president. TI, the world’s largest analog IC manufacturer with $9.9 billion analog sales in 2017, has been steadily increasing production of analog ICs on 300mm wafers over the last six years. In 2017, About 40 per cent of its analog chips were produced at two 300mm fabs and the percentage will likely continue to rise over the next several years. The cost of analog ICs produced on 300mm wafers is 40 per cent less than the cost of the same chip on 200mm wafers, according to TI. In addition, TI’s gross margin on analog chips produced on 300mm wafers is about six percentage points more than ICs made on a 200mm wafer. wafers is running high across multiple segments including automotive, IoT, cell phones and industrial. “The 200mm wafer market is at capacity,” said Anderson. “ New capacity is not coming out very quickly.” Capacity expansion for 200mm production is a challenge because of tight supply of equipment needed to produce 200mm wafers, he said. While supply is limited, demand continues to grow including from the automotive segment. “From a revenue standpoint, 29 per cent of all analog revenue is derived from the automotive market,” said Feldhan. “It has been slowly increasing each year as more electronics are used in vehicles. You have more electrification in cars and it requires a substantial amount of analog,” he said. Even though the smart phone market is slowing, it is still helping drive analog chip demand. The low-end smart phone market is still growing at double- digit rates, about 16 per cent,” said Feldhan. The high-end “flagship products” of cell phone manufacturers are growing about 2.4 per cent. Cell phones use application-specific and general-purpose analog ICs, including operational amplifiers, signal conditioning, interface circuits, A to D and D to A converters. linear regulators, switching regulators among others. The continuing growth in the number of data centers used by Internet services providers (ISPs) and large companies is also having an impact on the analog IC market and may be contributing to tighter supply, according to Anderson. Data centers typically are equipped with hundreds or thousands of servers, mainframes and storage units. “Right now, we are seeing some pretty good growth having to do with data centers. That’s a huge growth area right now for the overall semiconductor market including analog ICs,” said Anderson. Recent semiconductor industry consolidation may also be playing a part in supply conditions for some analog ICs. In some cases, two chipmakers may produce a similar product. When those two companies merge, often one of the production lines of the chip that is made by both suppliers is shut down, decreasing supply of the part. Anderson said there have been some fab closures as a result of mergers and acquisitions and some products have been discontinued. “But it’s typically been older products” and newer versions of the discontinued products are available to OEMs, he said. “From a supply standpoint I don’t think consolidation has much impact,” said Anderson. More consolidation within the analog market is possible. “I think we will continue to see a bit more consolidation probably focusing on some of the smaller players,” said Feldhan. Larger players may try to “solidify their offerings” by acquiring a smaller company that makes some analog chips that the larger acquiring company doesn’t. 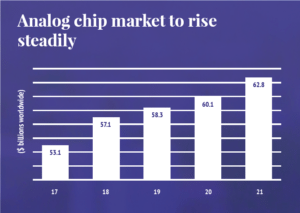 Because of continuing strong growth for multiple customer segments, the analog IC market will thrive for years despite the trend toward more system on chip (SoC) products. But now leading-edge chips use 10nm and 7nm technology and analog “does not scale well and it’s getting more expensive to make SoCs,” said Feldhan. As a result, the industry is looking at moving to advanced packaging and putting multiple chips such as an analog and memory IC in a stacked chip, and not including the functionality of the devices in an SoC, he said. Analog chipmakers are also manufacturing analog ICs in smaller packages. For example, TI recently introduced what it says is the industry’s smallest operational amplifier (op amp) and low-power comparators in a X2SON package, which measures just 0.8x 0.8mm. The amplifier is the first to use the tiny package and allows OEMs to reduce system size and cost. The devices will be used in a range of Internet of Things (IoT), personal electronics and industrial applications, including mobile phones, wearables, optical modules, motor drives, smart grid and battery-powered systems. This entry was posted in Europe, Global, James Carbone, North America, On Ticker, Semiconductors, Semiconductors, Semiconductors, top articles, UK. Bookmark the permalink.